Have you ever done this? Have you ever drawn or painted on a rock? Rock painting has so much history and I love how every painting is completely different that anything I’ve witnessed before. I love how just different color dots and strokes can turn something into a story. This is the first time that I have tried this and I think it looks pretty rough. 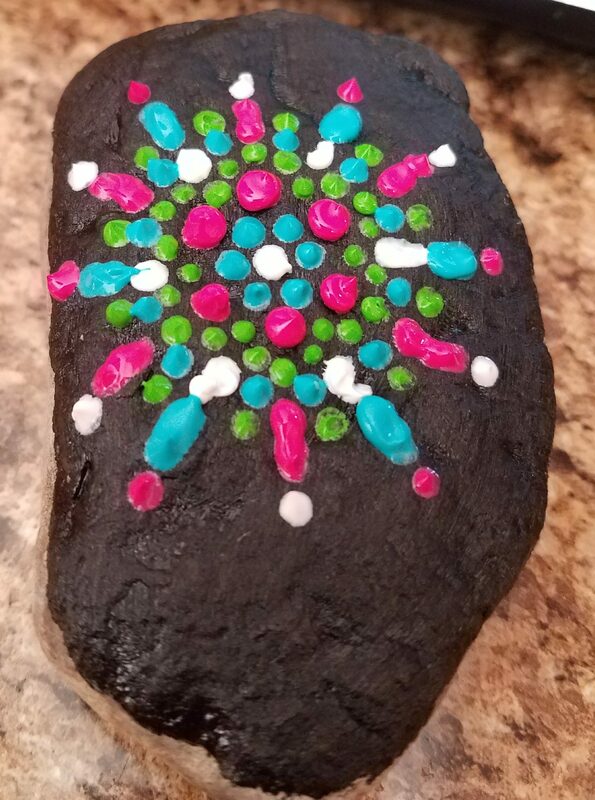 I used Acrylic Puffy Paint to do this, which wasn’t the best idea, but it gave the rock some pretty gnarly texture, which I end up really liking! These two were just the progress pics. 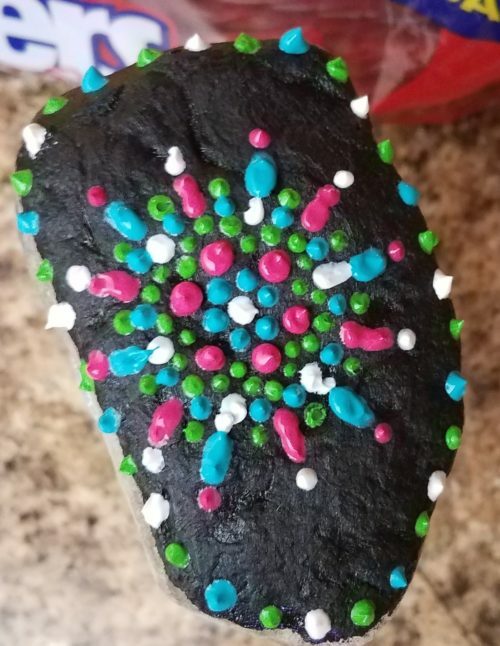 I started out painting the top half of the rock black so that I would have a good surface for the other colors to show up on. In the end I think it was a good idea because the other colors really pop. Now you can tell on here that working with puffy paint is not very nice. 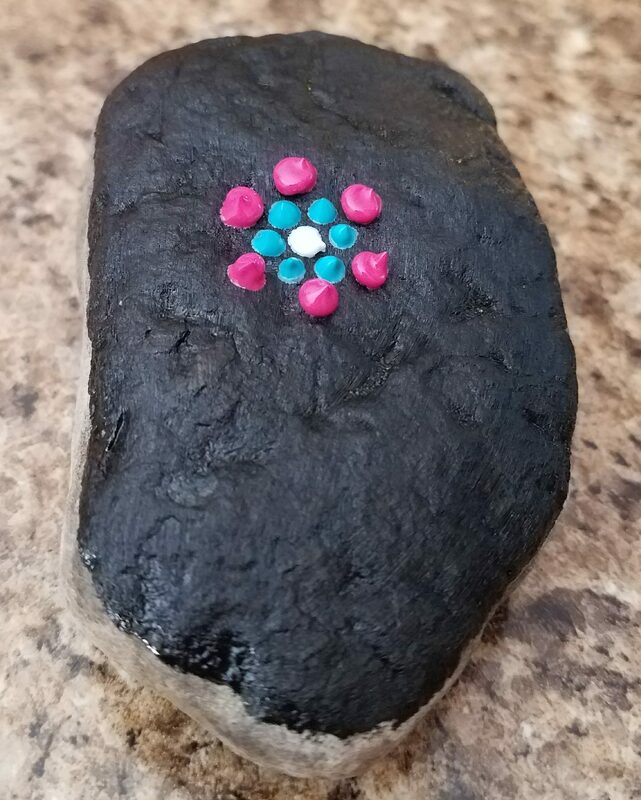 If there was an air pocket in the puffy paint pen, it splattered out over the rock. So, I just tried to go slow and when something smeared or changed, I just changed it all the way around the mandala. There is the final product. I really like how it is textured. I outlined the black paint with a few dots just to add a little more flavor. This rock was about the size and shape of a common mouse for your computer. I picked it up on the side of the walk and I had been holding onto it for about two weeks and just decided today was the day. Let me know what you like and dislike about this project and if you have ever had any experience with rock painting.